The buttery softness of this 50/50 Dark Brown Yak and Merino Top gives you loft and length, in one top, averaging approximately 3 inches in length and a micron count of approximately 19. 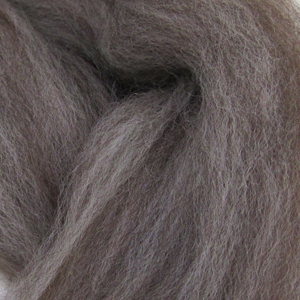 Our ready-to-spin Yak/Merino fibers are cleaned and dehaired. Yak fiber is soft and smooth with wonderful hand. It exists in several colors, including shades of gray, brown, black and white. The mean length of yak fiber is about 1.2 inches with a fiber fineness of 15-22 microns. It is combed or shed from the yak and then dehaired. The result is a splendid downy fiber similar to that of the camel. Yak Wool has always been one of my favorite fibers so I have put a great deal of effort into finding the best yak wool possible. Weaver Creek Fibers offers extremely soft yak wool (ranging from approximately 18.5 - 21 microns) with virtually no guard hair. In addition, we offer yak wool in several colors -- light brown/grey, brown, dark brown and depigmented white -- which are beautiful together or apart. The brown/gray yak wool is also sufficiently light in color for dyeing. Many hand spinners are afraid of yak wool’s short staple length in that it is only approximately one inch long. But because yak wool has great crimp and is not slippery, it is actually quite easy to spin. It makes a terrific lofty, woolen spun yarn. Merino sheep are known for their dense fine wool with lots of crimp, making for a soft and bouncy yarn. It takes dye very well and on its own is prized for softness and in blends with our other luxury fibers makes for a perfect companion. The Merino breed originated in Spain and quickly took hold around the world. Some of the very finest comes from Australia.